Amnon Kapeliouk (Hebrew: אמנון קפליוק) (22 December 1930– 26 June 2009) was an Israeli journalist and author. He was a co-founder of B'Tselem and was known for his close ties to Yasser Arafat. 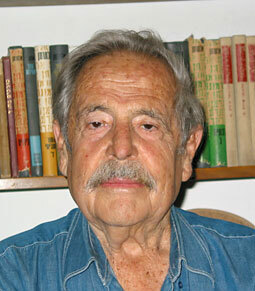 Haim Gouri (Hebrew: חיים גורי‎; born October 9, 1923, Tel Aviv) is an Israeli poet, novelist, journalist, and documentary filmmaker. Kalman Libeskind (Heb: קלמן ליבסקינד; born on 1970) is an Israeli journalist. Uzi Mahnaimi (born in 1952) is an Israeli-born journalist. He is a Middle East correspondent for the London-based The Sunday Times. He is best known for his exclusive stories on the Middle East. Dov Elbaum (born on 21 December 1970) is an Israeli writer, editor, journalist, television host and Jewish philosophy lecturer. Sayed Kashua (Arabic: سيد قشوع, Hebrew: סייד קשוע; b. 1975) is an Israeli-Arab author and journalist born in Tira, Israel, known for his books and humoristic columns in Hebrew. Natasha Mozgovaya (born 1979) is an Israeli journalist. She is a reporter for Voice of America and Walla!. Nili Tal (Hebrew: נילי טל‎, born Nili Herman in Tel Aviv, Israel) is an Israeli journalist and documentary film director and producer.